In the land of sushi and ramen, the last thing one would think of is to find a good burger joint here in Tokyo but we are wrong of course. The Japanese excels or attempts to excel in everything, even in making their yoshoku (foreign food) authentic. 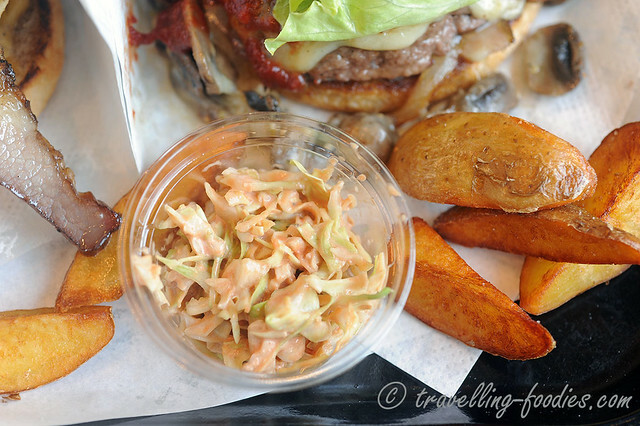 There are some hits and misses here and there of course but as far as gourmet burgers are concern, they are striving and doing very well over here. 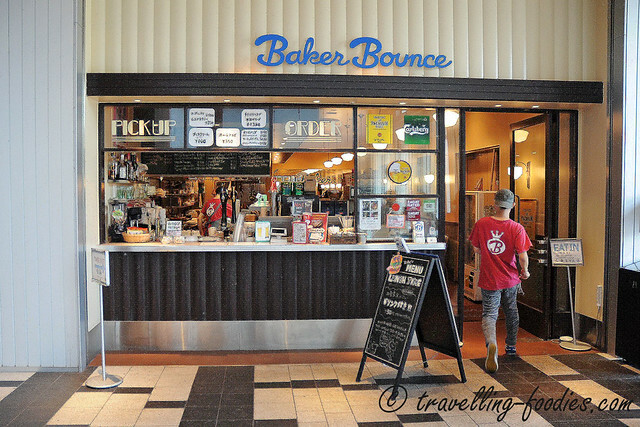 We’d shortlisted a couple of delis to visit during our recent trip to Tokyo and Baker Bounce which won quite a number of raves is top on the list. 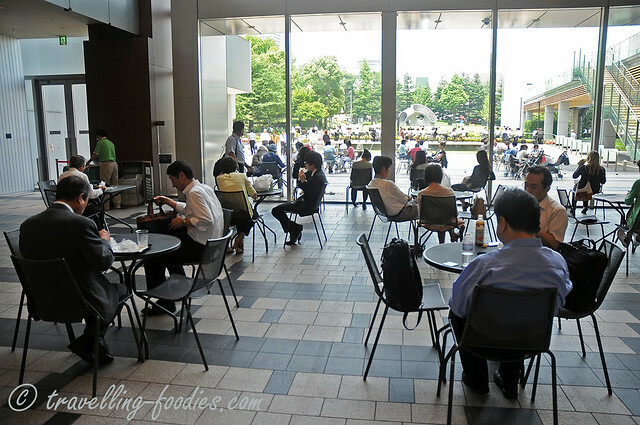 Tokyo Midtown, which lies in the heart of Roppongi is really an interesting place to visit. A large number of famous patisseries have outlets here, not to mention a string of restaurants which we wanna try out. Check out our review on Sadaharu Aoki’s flagship pastry shop in Tokyo Midtown here. Baker Bounce, looks like pretty much a standard American burger deli which one would find in New York. The decor, the yellowish lights all nicely suit up to assimilate the entire burger diner experience. Unfortunately, the deli was packed during the lunch hour when we visited. Waiting could take up to 30 min or more..
J and I ordered a set each for ourselves and the burgers were humongous! They were crazy big! But so so good! 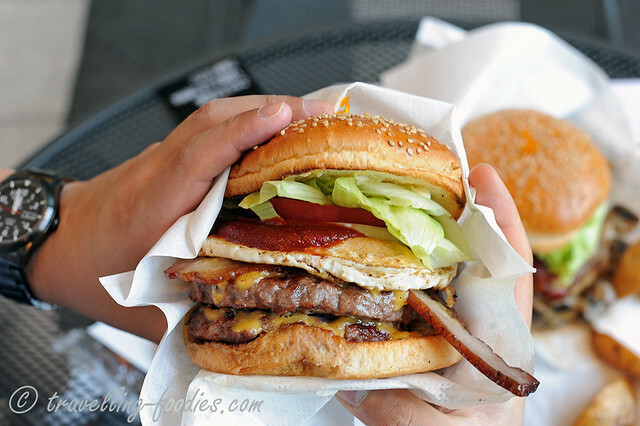 The Double Burger came with two gigantic beef patties the size of my palm and on top of that, there are a couple of thick slabs of bacon, a fried egg, fresh lettuce, tomatoes and onions to top the deck! In short, the stuff just keeps piling up! The sheer look of it excites me to no ends… literally orgasmica gastronomica! And quantity is not just what Baker Bounce burgers are about. They are crazy good too. The beef patties were cooked perfectly, i.e. they have a good oomph from all that quality time on the grill, with all that beautiful smokiness. The interiors were juicy to the max. In fact, the burgers were wrapped with some waxed paper pockets to catch the drips. You have been warned! The fried egg was well executed as well. The yolk was still runny and burst open to lather the beef patties with a generous coating of its golden creamy deliciousness. POW! It just hits you in all the right spots from just digging into the burger. Very good… wait… make that crazy good! The Grand Monterey was another beautiful creation. Truth be told, I didn’t order this initially but had something else in mind. But the counter staff told me that the two burgers I’d wanted are actually quite similar in construction but went on to recommend the Grand Monterey instead. We took his suggestion and I’m so glad that we did! Despite having only a single beef patty, the burger makes up for it nicely with a super duper generous amount of sauteed mushrooms. There was so much mushroom that it literally spilled out from the burger! The mushrooms and patty was slapped with a thick piece of monterey cheese which melted gloriously to bind bits of the mushroom together. The heat from the freshly char-grilled patty sent up wafts of all that cheezy and mushroomy goodness up my nostrils as I walked the tray from the deli counter to our table. Totally tantalising! I’m a big fan of mushrooms and cheese so if the double burger was crazy good, this was absolutely phenomenal! Very good sides served as well… a small portion of coleslaw and thick stubby chunks of chips from whole potatoes. In summary, it was a very very mean and wholesome burger experience. Satisfying, gratifying, satiating, enthralling and all the synonyms you can think of! We were completely taken over and blown away! Will be back… most definitely! With each set going around 1300-1600 Yen a set, the burgers here ain’t cheap at all. There are cheaper sets of course, those that hover around 1000 Yen each. 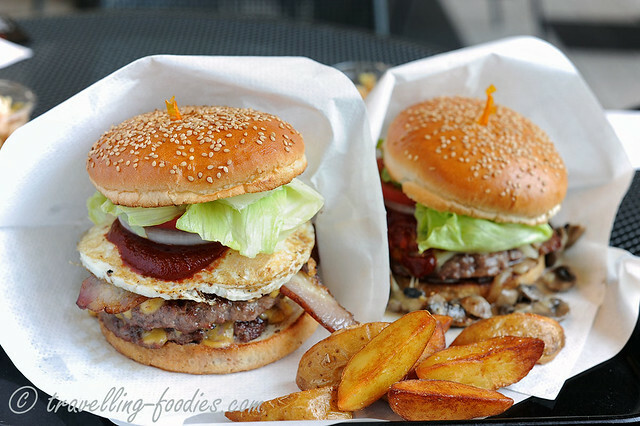 But looking at the portion size and quality of the burgers, they were worth every cent of it. For ladies and small eaters, we suggest that you share a burger, opt for a smaller standard burger or perhaps a tortilla wrap instead. There are weekday lunchtime promos where the drinks order would come free flow if one dines within the deli. But we dined out in the open galleria area, saved ourselves that additional 10% service charge, from downing all that sugary soft drinks and of course all that smokiness inside which would be great in the burgers but not on our clothes. Avoid lunch or dinner peak hours. They start at 11.00 am so go around that time before the maddening lunch crowd steps in. Alternatively, go for a late lunch at 2 pm or later when everyone’s rushed back to their offices. 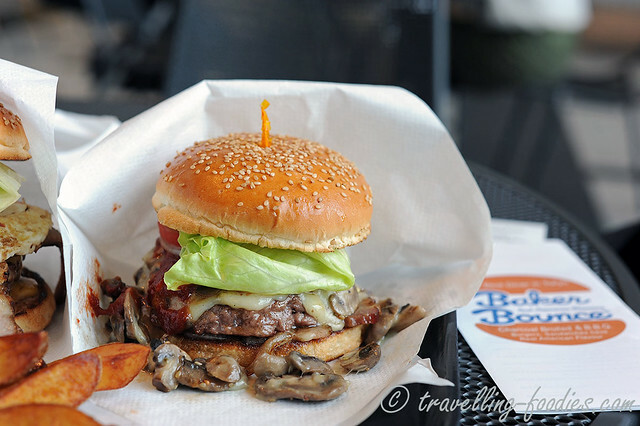 This entry was posted on October 3, 2014 by Alan (travellingfoodies). 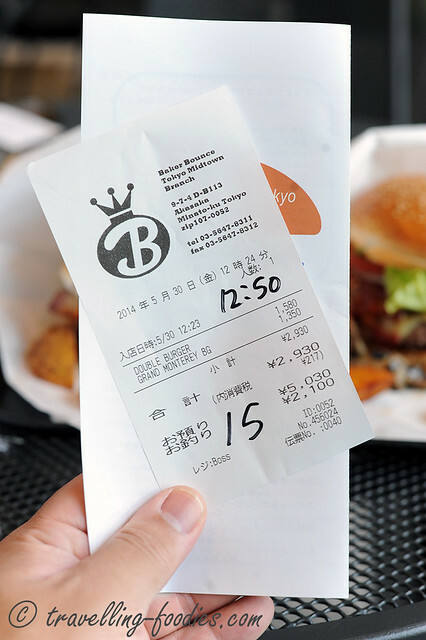 It was filed under Food, Travel and was tagged with Akasaka, Baker Bounce, Chips, coleslaw, Double Deck Burger, Gourmet Burgers, grand monterey burger, slaw, Tokyo Midtown, Wedges. new york city prices. but looks like it’s worth it.